Obituary for Lillian Berneice Druckenbrodt | Langeland Family Funeral Homes, Inc. Passed away peacefully Saturday afternoon March 10, 2018. She worked at the Upjohn Company during the war. She also worked at Tias Gift Shop in Kalamazoo. She loved to entertain. She enjoyed sewing and was a good cook & baker. 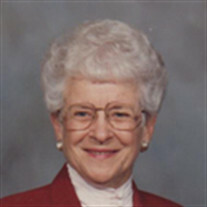 She served as president of the PTA and was involved with 4-H. For years she was an active member of the Eastwood Church of God, where she was in the Eastwood Trio. She later became a member of Westwood Church of God. On August 16, 1946, she was united in marriage to Frederick Eugene Druckenbrodt, who preceded her in death on March 18, 2016. She is survived by a son, Douglas A. (Paula) Druckenbrodt of Vicksburg and two daughters, Karol K. (David) Sprague of Gobles and Nancy A. (Glenn) Dunbar of Swansboro, NC; nine grandchildren; twenty-two great-grandchildren; ten great-great-grandchildren and two more expected soon; two brothers in law and one sister in law, Harold Brant, Dee Poolman and Kenneth E. Druckenbrodt of Laport, TX; and several nieces and nephews. She was preceded in death by three brothers and two sisters, Johnny Poolman, Howard Poolman, Robert Poolman, Dorothy Brant and Mary Steward. Friends may visit with the family from 6-8 p.m. on Wednesday, March 14th at the Langeland Family Funeral Homes, Westside Chapel, 3926 S. 9th St., Kalamazoo, MI 49009. The funeral service will be held at 11 a.m. on Thursday, March 15th at the funeral chapel, where friends may visit with the family one hour prior to the service. Private burial will take place in Ft. Custer National Cemetery. Memorials may be given to Alzheimer's Foundation, American Heart Association or National Parkinson's Foundation. The family would also like to thank Southern Care Hospice and the Laurels of Galesburg for their loving care.